Hastinapur once was the capital of India. Hastinapur is related with the rich history of india.Many kings ruled there for long period. For example, Pandvas(Hindu mythology),king Shivraj( Naga vansh),king Samprati(Grandson of Ashoka), etc. This place is beautiful, spectucular and artistic with art at peak.There are so many places to visit in Hastinapur. Temples in Hastinapur are very famous. Especially, Hastinapur Jain mandir. 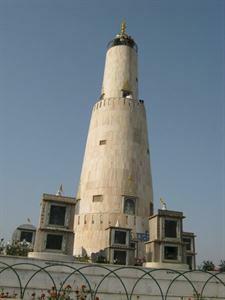 Hastinapur is situated about 37 km from Meerut, Uttar Pradesh. From Delhi, it is 110 km away. Hastinapur has a rich history and has been influenced by various rulers and dynasties. Many times destruction and construction took place there, still, Hastinapur survived as an artistically beautiful place. Hastinapur is full of temples and religious places. The architecture of all temples is really brilliant. Hastinapur temples are very famous. Places to visit in Hastinapur are listed below. Hastinapur is also considered as the Teerth of Jains. This place is very much related with Jains as described in Jain's text. As per their texts, Hastinapur was one of the mahajanpads established by Bhagwan Adinath, who is also known as Rishab Dev. This place has been glorified with many great Jain Temples. Jain temples architecture is very food, carving on temples wall shows the history of Janis. A big area has been covered by Jain temples there and has taken so long time in completing those temples. Many are under construction. Most of the temples are owned by some committee, and a hierarchy is maintained in Temple staff. Grand celebration is organised by these committees on different occasions. Digambar Jain Mandir is huge Temple. It is also known as Hastinapur Jain temple. It has one central dome which is very big and has a statue of Bhagvan in the centre. Facility for adoring is also available. jal mandir, vradhashram, Jain library are also situated in its premises only. Digambar Jain Bada Mandir is magnificent sanctum place for adoration and worship. This Temple is open for visit from 5:30 in morning till to 8: 30 p.m.
Jambudweep is an area having many temples and a tall structure surrounded by many small small temples and green gardens. That tall structure is 24 meters tall and has green parks surrounding the main compound. In this Jambudweep compound, twelve splendiferous temples are situated as Dhyaan Mandir. Lotus Temple, Trimurti Mandir, keerti stambh etc. : The main tall structure in Jambudweep. This Temple represents the present past and future Tirthankars. It is shown in three stages, having 72 temples, 24 on each stage. It has a main building in the center, which is 40 meters high. It is tallest among all structures in Hastinapur. This is not in Jambudweep area, it is near to Jambudweep. It has eight levels. The roof is open and designed with many statues of Lord Buddha. This is a very old temple of Lord Shiva. This temple is very sacred to Hindus, but maintenance is very poor. But still, as this is very old, so good to see and get blessed. This is also an old Temple of God Shiva. The building is not very great but the devotion of people is much in this temple. This temple is believed to be in existence from the time of Mahabharat. This sanctuary is mainly known for migratory Birds. This sanctuary has rich fauna especially mammals, reptiles, amphibians etc. Nilgai, Chital, wolf, swamp deer, gharial etc are included in Hastinapur sanctuary's wildlife population. From Meerut: Buses are available frequently form 7:30 a.m. to 8 p.m. to Hastinapur. From Delhi, buses available from Delhi to Meerut. nearest Railway station is Meerut Railway station, from there take taxi or bus. One has to take Train or bus to Meerut then One may have Taxi. Recommended time is anytime from month of September to February. As it has Hastinapur experiences very high and very low in temperature, so these extremes can be avoided. Travelling here in monsoon is not recommended as It will be tough to reach few temples. Delux flats, semi delux flats are availble for pilgrims in various Dharamshala. Items needed for staying there like utensils, Bed etc are available. For food, Mess facility is available in Digambar Jain Mandir Bhojanshala. A large number of people can stay here. Many Dharamshalas are there for a comfortable stay. Even Mandir Campus provides a place to stay and food.